As Head High School Coaches the ability to peak players individually and as a team for, and during playoffs is critical for ongoing success for your program. In working with 1000’s of players and coaches at Volleyball1on1 we have developed our Volleyball1on1 Superior Coaching Systems ™ to help you successfully peak your players for playoffs every year consistently. In this article, I will help you discover one of the most powerful coaching tools in the modern science of coaching volleyball that will forever change how you coach volleyball for the better if you choose to apply it. Let’s review the diagram to the right, which is an excerpt from the Volleyball1on1 Coaching Manual on “Whole Person Growth” ™ as this is the foundation of this powerful coaching principal. Over the course of a season, our job as coaches is to steer the team towards a “winning team culture,” while establishing “What Great Looks Like!”. ® The result is that players will develop confidence individually, which will then permeate onto the team as their behaviors and performances begin to match their self-ideal which we help coaches establish when they work with our “One Of A Kind” Volleyball1on1 Summer Camp curriculum. We have designed comprehensive “Superior Coaching Systems” to help you establish a culture weaved with this powerful “Whole Person Growth” tool. This information is covered extensively in our 350 page Volleyball1on1 Coaching Manuals which Head High School Coaches and their staff receive and are training with during their Volleyball1on1 Summer Camp week. As a coach we want players to exude maximum confidence in playoffs and at the end of season. The coach is in full control of the practice environment and therefore in full control of how players build confidence and thus peak for and during playoffs. In early season, the coach needs to create an environment where players / teams are learning skills and living into challenges. By this I mean that expectations are very high and players / teams will most often not meet expectations. Compliments are less frequent as players are less likely to meet high expectations. By mid-season players and teams are meeting expectations more frequently. Skills learned are closer to expectations and players are meeting challenges more frequently individually or as a team. 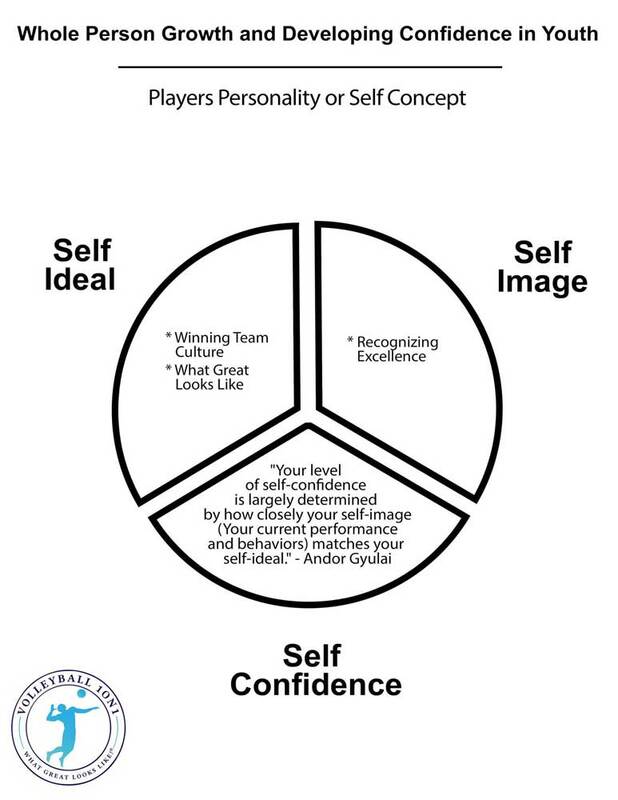 As players are recognized more often for their efforts over the course of the season and their self-concept matches their self-ideal, their self-esteem will build. Great coaches are masters of raising expectations and meeting those expectations. By crafting an environment where players journeys over the course of a season have raised their expectations of what is possible for themselves and then meeting those expectations, coaches can help their players develop massive amounts of self-esteem. This helps coaches then peak their players for and in playoffs! Coaches who follow the Volleyball1on1 Superior Coaching System ™ are currently crafting an environment where players meet expectations and where coaches can “recognize excellence” in the self-ideal they established. Importantly, players are peaking, as they feel massive self-esteem from meeting difficult expectations set by their coach at the beginning of the season or journey together. How Can You Add This To Your Program? If you are looking to build proven winning “Superior Coaching Systems” ™ into your program the solution, we highly recommend you host a “One Of A Kind” Volleyball1on1 Summer Camp at your school. At your Volleyball1on1 Summer Camp we will work with you to help establish a high self-ideal for your players with “The Volleyball1on1 Winning Culture,” and “What Good Looks Like.” ® During this time, we help you craft an environment where you can help players individually or as a team, live into those expectations thus building your players self-esteem.